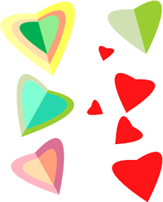 Valentine card software helps you quickly DIY Valentine Card with built-in shapes. It also offers some New Year card templates and examples. 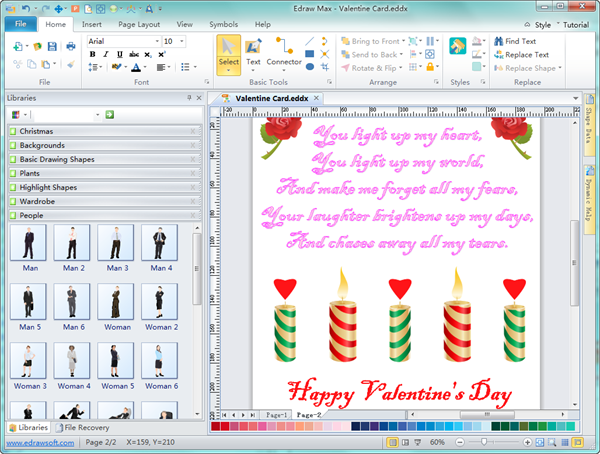 Valentine card software supports you to create creative and attractive Valentine Card for your special one. Your deep love can be expressed in a distinctive way. Insert your own photos, pictures and type in whatever you want to say. Valentine card software is specially designed for both professional designers as well as beginners to DIY Valentin's card. Beginners can take advantage of the built-in symbols and ready-made templates to design Valentine's Day cards. As for professional designers, they can use the Pen and Pencil tools to draw any image they want. Click here to try Valentine card software for free. 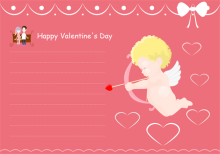 Valentine card software includes many useful built-in elements which will be of great help when you draw Valentine card. Symbols like flowers, gifts, and hearts are great elements that can add charm to your Valentine cards. 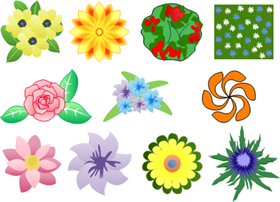 You can resize, recolor, rotate and ungroup the symbols to form new shapes. Start with pre-drawn shapes and insert your own photos or pictures to finish. Add color gradient effect and texture to your design. Intuitive and user-friendly interface that is similar with MS program. Support to create many type of greeting cards such as Christmas card, New Year Card and Halloween Card. Various ready-to-use Valentine card templates and examples. 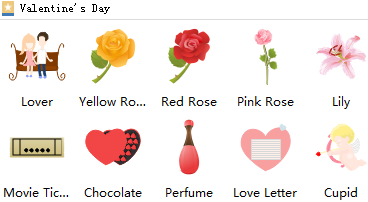 Below are some unique Valentine card examples created by Edraw Valentine card software. Click the thumbnail to view large versions. You can also download them for free.